At some point during the winter or spring, one’s attention invariably turns towards the upcoming trail running season. 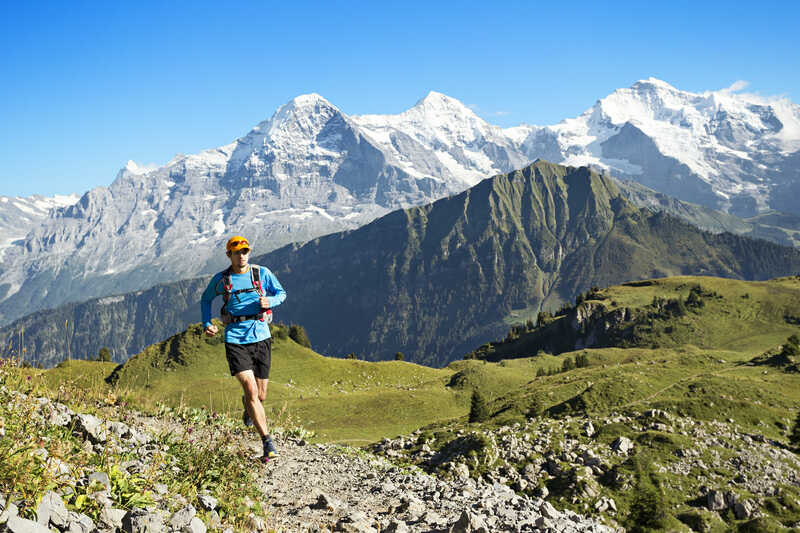 For me, it happened recently when I received one of the best trail running guides to the Swiss Alps racing scene, the Swiss Athletics Guide des courses for all the 2016 races. This year promises some new events as well as old favorites, like Sierre-Zinal and the Aletsch-Halbmarathon. In contrast, I’ve also noticed some familiar trail races on hiatus this year, either permanently or temporarily due to various factors. To help you plan for the season — and to inspire some enthusiasm, if it’s needed — here’s a quick preview of new trail races in the mountains of France, Italy and Switzerland. Run the Alps’ blogger Emmie Collinge in Lodrino Lavertezzo Skyrace in 2015. She set a women’s course record with a time of 2 hours, 10 minutes! —First comes the brand new Vertical della Croce, held early in the season on June 12, as part of the Lugano & Capriasca Scenic Trail event in the Italian-speaking canton of Ticino, Switzerland. It takes runners on a 5-km course with 1,000 meters of elevation gain—right at the limit of Skyrunning’s definition of a vertical kilometer. —Later in the season on August 6, you can participate in the 2nd annual Courmayeur Mont Blanc Skyrace in Italy. This challenging race has more than 2,200 meters of elevation gain spread over a distance of only 11 km. This year, the event adds a second course—the Skyrace Night K1000, a vertical kilometer at nighttime. —Back in Switzerland, on the French-speaking side and near the end of the season on November 6, is the Verticale d’Hauterive, also in its second year. The course starts at the shores of Lake Neuchâtel and travels through the forest by the shortest route to the summit of Chaumont. Another major new race in 2016 will be the inaugural edition of the Ultra Tour Monta Rosa stage run, organized by British ultra marathoner Lizzy Hawker. (Last year featured a run-through of the event, which was dubbed the “Zero Edition!”) This ultra includes an astounding distance of 116 km and over 7,500 meters of ascent. Held from September 1-3, the course starts in Cervinia, Italy, and finishes in Grächen, Switzerland. Runners of this arduous course will be rewarded with unforgettable views as they run around the Matterhorn. If you’re looking for more distance and less of an extreme vertical climb, check out Il Cuors da Flem—another new race in 2016. Located in the Swiss canton of Graubünden, the inaugural edition of this half-marathon takes place on June 4. Offering 500 meters of elevation gain, it starts and finishes in the picturesque village of Flims Waldhaus. Along the course, you’ll see some beautiful mountain lakes, such as the Caumasee. *Inaugural race to be held in 2016. And finally, there’s Arrancabirra, a unique trail race in the Courmayeur-Aosta Valley that serves beer to runners at various aid stations along the 18-km course. Runners must maintain their equilibrium on a course that includes 1,410 meters of elevation gain. For this race, you can register as a team with your dog, and prizes are awarded for best costume. Arrancabirra celebrates its 11th edition on October 8, 2016. We thought this race with a festive atmosphere might be pique your interest as you make your trail running plans for the year! What are your trail race plans for 2016? I’m currently debating between the Aletsch-Halbmarathon and Il Cuors da Flem… As the year unfolds, if you’re looking for ideas, Run the Alps will continue to provide trail race updates via our blog, Laces (you can subscribe via Run the Alps’ homepage). If you have any alpine trail race news to share with Run the Alps, whether it’s information about a new race or changes to an existing race, please don’t hesitate to contact us. Hi there Heddi Nieuwsma! What a fantastic idea with all those marathons. Are you still in Switzerland? I moved in here 2 months ago and I can’t wait to go on my first trail running marathon. Are you still in Switzerland or you moved on? Hi Andreea, There are lots of great trail races to choose from in Switzerland. You can find many listed on the Run the Alps calendar here: http://runthealps.com/races/ Good luck, and welcome to Switzerland!